Get to know the jury of the 1st EuroStrings Composition Contest for Classical Guitar. The winner and the finalists of the 1st EuroStrings Composition Contest for Classical Guitar will be announced on EuroStrings website and social media pages on February 28. 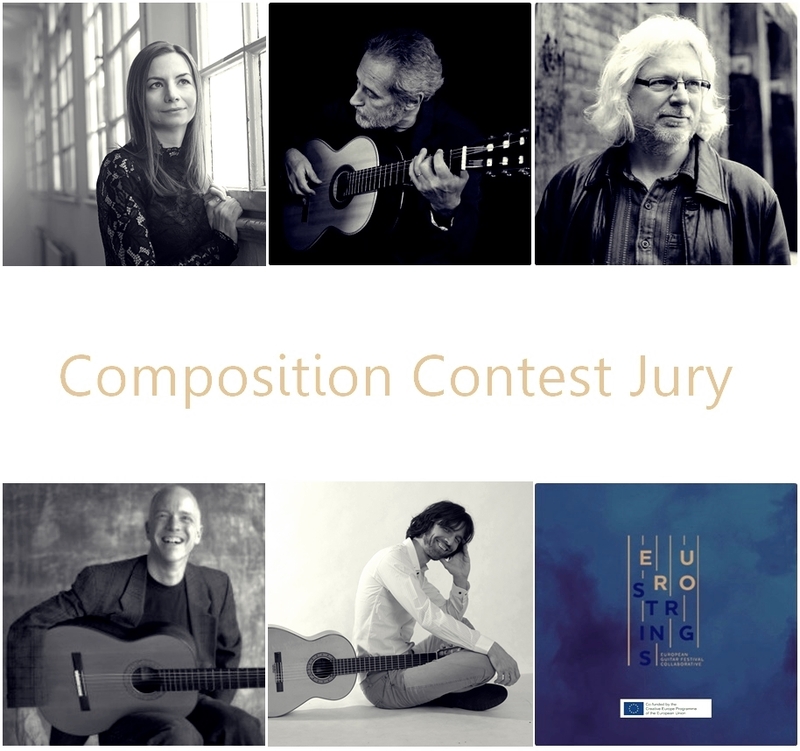 Composition Contest Jury Members are Nina Šenk, Sergio Assad, Stephen Goss, Brian Head and David Pavlovits. Nina Šenk obtained her master’s degree in the class of Prof. Matthias Pintscher at the University of Music and Performing Arts in Munich, in 2008. She is a recipient of many awards, including the first prize at the Weimar Spring Festival of Contemporary Music for her composition Movimento fluido in 2008. In 2010, the Rector of the University of Ljubljana awarded her special recognition for artistic work in the area of musical composition and performance as well as architecture. Nina Šenk’s works have been performed at numerous important international festivals and in many other concerts around the world with various orchestras and ensembles. Sérgio Assad is a Brazilian guitarist, composer, and arranger who often performs with his brother, Odair Assad in the guitar duo Sérgio and Odair Assad, commonly referred to as Assad Brothers or Duo Assad. At the age of 17, he began his studies under the best known classical guitar teacher in Brazil at the time, Monina Tavora. Sergio later went on to study conducting and composition at the Escola Nacional de Música in Rio de Janeiro, and worked privately with Brazilian composition teacher, Esther Scliar. As a composer, Assad has completed more than fifty works for guitar, many of which have become standards in the guitar repertoire. His “Aquarelle” for solo guitar was chosen as the required contemporary work for the 2002 GFA Competition in Miami. In 2007, he wrote the set piece for the 2008 GFA Competition named “Valsa de Outono”. Stephen Goss’s music receives hundreds of performances worldwide each year. It has been recorded on over 80 CDs by more than a dozen record labels. His output embraces multiple genres: orchestral and choral works, chamber music, and solo pieces. Goss’s work is marked by a fascination with time and place – both immediate and remote – and the musical styles that evoke them. His compositional voice is shaped by his parallel career as a guitarist – that is to say, as a performer, transcriber, arranger, improviser and collaborator with other composers and performers. Stephen Goss is Chair of Composition at the University of Surrey (UK), Director of the International Guitar Research Centre, and a Professor of Guitar at the Royal Academy of Music in London. Brian Head enjoys a vibrant, frequently frenetic career as a guitarist, teacher, and composer, performing as a soloist and collaboratively with many groups, including the Los Angeles Philharmonic and their New Music Group, the New World Symphony, Le Rossignol, Inauthentica, Jacaranda and Xtet. Brian’s own compositions have been performed for many years throughout the U.S. and abroad. Since 2001, Brian has held a dual appointment on the Classical Guitar and Composition faculties as a senior lecturer at the Thornton School of Music at the University of Southern California, lectures on a wide range of subjects, and directs the undergraduate music theory program. From 2004 until 2010 Brian led the Guitar Foundation of America as its president. The Hungarian guitarist-composer Dávid Pavlovits performed in over 30 countries, including recitals at the Carnegie Hall in New York, the Opera House of Cairo and the Shanghai Conservatory. He was awarded Artisjus-prize for his activity in contemporary music. He has worked for Sony Pictures Television as a music designer. He is since 2004 head of guitar department at the University of Szeged. Since 1993 he has been a laureate at several music competitions. As a composer, he has published a great number of guitar pieces with Ricordi and Doberman/Yppan. His Stormbird Sonata has been part of several international competition’s set pieces. His Preludes are part of the examination program of Trinity College, London. His concerto for guitar and ensemble was premiered by William Kanengiser.